The Cathedral Quarter BID have funded the installation of a large number of colourful hanging baskets in the area. 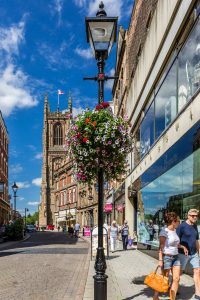 Working alongside Derby City Council, the baskets have been installed on existing infrastructure on Queen Street, Cathedral Road, Iron Gate, Market Place and Cornmarket and will be in place until the end of September, weather permitting. Neighbouring St Peters Quarter BID have also funded floral displays throughout St Peters Street, The Spot and London Road area. The baskets will take approximately one to two weeks to reach full bloom.